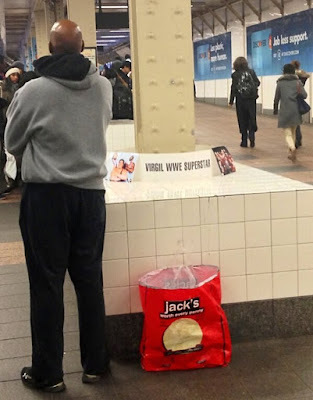 Meet Wrestling Superstar Virgil: 30-year professional wrestling veteran, former Million Dollar Champion, former nWo head of security, and best known as bodyguard/butler/manservant for the legendary "Million Dollar Man" Ted DiBiase. But we all know him for that guy who inspired a ton of letters about wrestler run-ins on Deadspin and a YTMND page set to the original Eric Carmen version of "All By Myself." "New tricks?" Definitely, like that crucifix hold he used to pin Bastion Booger with. It doesn't look like a million dollars or anything, but it got the job done. On top of the online fundraiser, Wrestling Superstar Virgil also found himself in local New York TV news, where the former 1992 PWI #3 Most Improved Wrestler is mentioned alongside MTV Superstar Brandy. 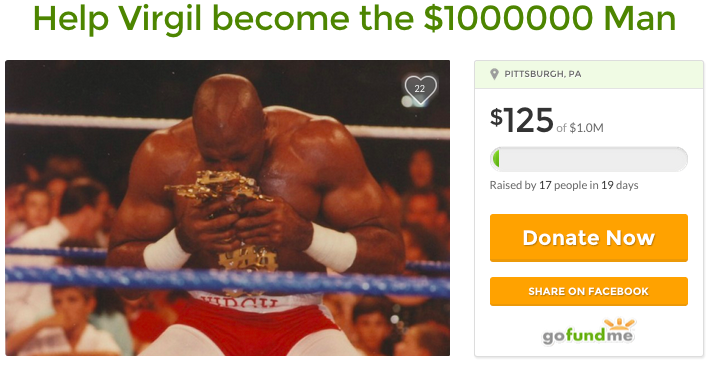 For all that's been said about Wrestling Superstar Virgil, I think he's a long way from reaching his first million (which doesn't really make someone a millionaire). Maybe selling 66,666.67 8x10s in a few thousand wrestling conventions would do a better job than raising $125 over 19 days in an online fundraiser. We don't know if Wrestling Superstar Virgil still goes to wrestling conventions or sets up his merchandise in parking lots and hobby shops, and we don't know if the GoFundMe page is legit as it comes. We're pretty sure of one thing, though: he's got miles to go before he sleeps.